If you are making your own pumpkin puree, preheat a conventional oven to 400 F. Cut the top of a pie pumpkin off to remove the stem and then cut the pumpkin in half. Remove the seeds and stringy innards and place it flesh side down on a baking sheet. Roast the pumpkin for 45 minutes to 1 hour until very tender. Let cool at room temperature until the pumpkin is easy to handle. Scrape the flesh away from the skin and weigh out 15-16 ounces. Otherwise, open a 15 ounce can of pumpkin puree. In a blender or food processor, combine the weighed pumpkin flesh and all of the remaining ingredients and process until very smooth. Taste and add more syrup if you like it sweeter. Transfer the mixture to a heavy bottom pot. 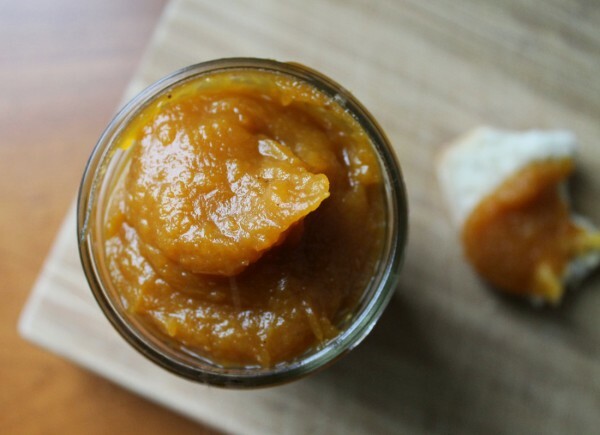 Stir the pumpkin butter constantly over a medium low flame for 20-25 minutes until thickened. Take care to stir continuously, otherwise the mixture will bubble up. ​Let cool and store an airtight container in the fridge for up to 1 month. Pumpkin butter also freezes well.